The diary of a 21st century Mummy: Gastroenteritis, Spring forward and other stuff..
Gastroenteritis, Spring forward and other stuff..
Well it's been a pretty horrible few days. Benjamin, Noah and myself have had gastroenteritis:( It has been awful. Benjamin started first, I had hoped his upset tummy was down to teething, but no, the vomit then started which led to me taking him to the Dr on Friday to be told he had the stomach flu. Friday was our wedding anniversary but we shelved plans to go out due to Benjamin being poorly, and ordered in a Chinese and watched the new Keifer Sutherland Show "Touch". (I really enjoyed the show. I love Keifer Sutherland, but I think it will take a few episodes to get Jack Bauer out of my head) had a glass of wine, went to bed. 4am and Noah starts puking. I woke on Saturday feeling headachy and nauseous. By the afternoon I too had succumbed. I went to bed at 1230pm Saturday afternoon and finally surfaced 1pm Sunday, the first time since I was a teenager I had spent that long in bed. I forced myself to take a walk to the park, and I ate an ice lolly. The fresh air seemed to really help. So here we are, 5 days on for Ben and it's still not right. Noah is unable to go to nursery until Thursday at the earliest as he is still having an upset tummy. As am I. But the biggest thing is the the virus seems to have killed off my milk supply:( I'm gutted! We have been breastfeeding for 10.5 months, and the thought of it stopping due to a situation that isn't a choice made by myself or Ben is killing me. I have brought Fenugreek today, I have tried pumping, but nothing is coming off. My let down is taking an age to trigger. Ben has been fussy whilst nursing the last couple of days, obviously he is getting nothing out. So I am hoping that an increase in fluid and food by myself plus extra nursing/pumping sessions will build up the supply again. The clocks went forward on Saturday night, so we lost an hour sleep, but the weather has been amazing this weekend So I'm really gutted that we had to spend it in bed all weekend being ill. Being on my own today whilst Tim went back to work trying to deal with two poorly children plus still being ill myself has been hard. By 415 I was in a heap on the floor in tears. 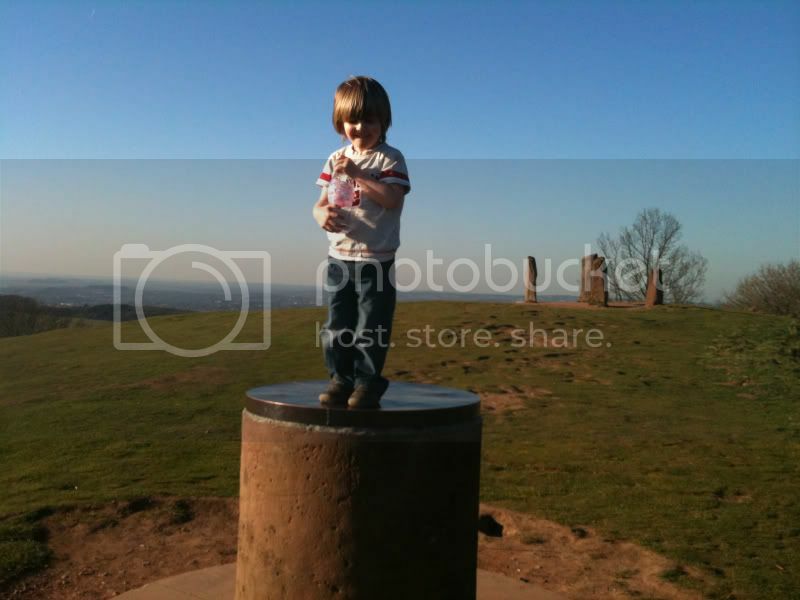 But we have managed to get to the park a couple of times and Tim took Noah to Clent Hills when he got in after work to give me a bit of a break. I hope the rest of the week improves.